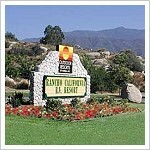 Outdoor Resorts Rancho California RV Resort is very nice park complete with a 15 hole, par 3 golf course. The campground is well landscaped and has a lovely country club setting. A lot of campers own their lots and the people are very friendly. Rancho California RV Resort is a great place to get away from it all and feel pampered. The park is fairly large, with over 590 sites. Interior roads are paved and the sites are comfortably large, with concrete pads and picnic tables. There are a good number of big-rig sites with full hook-ups. The staff here is friendly and they are quite accommodating. They have plenty of amenities including a golf course, 5 swimming pools, 6 lighted tennis courts, two clubhouses and several lakes with fishing and paddle boats. Also a laundromat and a small camp store with a limited number of groceries and camping supplies. Pets are allowed here. One important note… they only allow 5th wheels and motorhomes.